Are you searching for Mr. Right? We all dream of that magic moment when sparks fly and the attraction is undeniable. However, during the search, it is often enjoyable to take a time out and share a few stolen moments or even a whole weekend with Mr. Right Now.This anthology showcases a series of stories that describe random encounters involving Mr. Right Now: sizzling-hot lunchtime meetings, passionate, tense clashes in the back seat of a car, once-in-a-lifetime opportunities or casual arrangements of convenience. These moments can last a handful of explosive minutes or build into lasting romance - you never know when Mr. 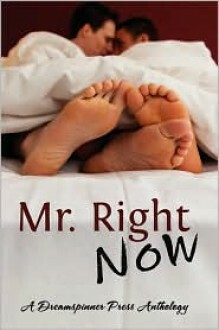 Right Now is going to surprise you and become so much more.Have you met him before and desired him from afar? Or is he a complete stranger you bumped into at the corner supermarket or in a dark club? Give Mr. Right Now a chance. Even if all you think you have is the now... he might surprise you.